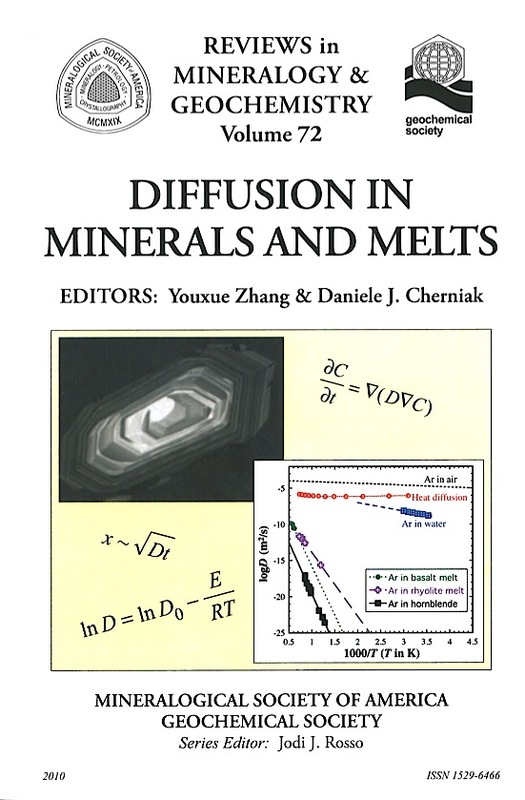 The chapters in this volume represent an extensive compilation of the material presented by the invited speakers at a short course on Diffusion in Minerals and Melts held prior (December 11-12, 2010) to the Annual fall meeting of the American Geophysical Union in San Francisco, California. The short course was held at the Napa Valley Marriott Hotel and Spa in Napa, California and was sponsored by the Mineralogical Society of America and the Geochemical Society. Because diffusion plays a critical role in numerous geological processes, petrologists and geochemists (as well as other geologists and geophysicists) often apply diffusion data and models in a range of problems, including interpretation of the age of rocks and thermal histories, conditions for formation and retention of chemical compositional and isotopic zoning in minerals, controls on bubble sizes in volcanic rocks, and processes influencing volcanic eruptions. A major challenge in the many applications of diffusion data is for researchers to find relevant and reliable data. For example, diffusivities determined in different labs may differ by orders of magnitude. Sometimes the differences are a result of limitations not recognized in certain diffusion studies due to the materials or methodologies used. For example, diffusivities determined through bulk analyses are often orders of magnitude greater than those obtained from directly measured diffusion profiles; the former are often affected by cracks, extended defects and/or other additional diffusion paths whose influence may not be recognized without direct profiling. Differences in depth resolution of analytical techniques may also contribute to discrepancies among measured diffusivities, as can the occurrence of non-diffusional processes (e.g., convection, crystal dissolution or surface reaction) that may compromise or complicate diffusion experiments and interpretations of results. Sometimes the discrepancies among datasets may be due to subtle variations in experimental conditions (such as differing oxygen fugacities, pressures, or variations in H2O content of minerals and melts used in respective experimental studies). Experts in the field may be able to understand and evaluate these differences, but those unfamiliar with the field, and even some experimental practitioners and experienced users of diffusion data, may have difficulty discerning and interpreting dissagreements among diffusion findings. For those who want to investigate diffusion through experiments, it is critical to understand the advantages and limitations of various experimental approaches and analytical methods in order to optimize future studies, and to obtain a clear sense of the "state of the art" to put their own findings in perspective with earlier work. Two early books were important landmarks in diffusion studies in geology. One was a special publication by Carnegie Institution of Washington edited by Hofmann et al. (1974) titled Geochemical Transport and Kinetics. The other was a Reviews of Mineralogy volume edited by Lasaga and Kirkpatrick (1981) titled Kinetics of Geochemical Processes. Various recent tomes are available on diffusion theory in metallurgy, chemical engineering, materials science, and geology (e.g., Kirkaldy and Young 1987; Shewmon 1989; Cussler 1997; Lasaga 1998; Glicksman 2000; Balluffi et al. 2005; Mehrer 2007; Zhang 2008) and the mathematics of solving diffusion problems (e.g., Carslaw and Jaeger 1959; Crank 1975). There have also been summaries of geologically relevant diffusion data (e.g., Freer 1981; Brady 1995), review articles and book chapters presenting diffusion data for specific mineral phases (e.g., Yund 1983; Giletti 1994; Cherniak and Watson 2003) and for specific species in minerals and melts (e.g., Chakraborty 1995; Cole and Chakraborty 2001; Watson 1994) and applications of diffusion in geology (e.g., Ganguly 1991; Watson and Baxter 2007; Chakraborty 2008). However, there is no single resource that reviews and evaluates a comprehensive collection of diffusion data for minerals and melts, and previously published summaries of geologically-relevant diffusion data predate the period in which a large proportion of the existing reliable diffusion data have been generated. This volume of Reviews in Mineralogy and Geochemistry attempts to fill this void. The goal is to compile, compare, evaluate and assess diffusion data from the literature for all elements in minerals and natural melts (including glasses). Summaries of these diffusion data, as well as equations to calculate diffusivities, are provided in the chapters themselves and/or in online supplements. Suggested or assessed equations to evaluate diffusivities under a range of conditions can be found in the individual chapters. The aim of this volume is to help students and practitioners to understand the basics of diffusion and applications to geological problems, and to provide a reference for and guide to available experimental diffusion data in minerals and natural melts. It is hoped that with this volume students and practitioners will engage in the study of diffusion and the application of diffusion findings to geological processes with greater interest, comprehension, insight, and appreciation. This volume begins with three general chapters. One chapter presents the basic theoretical background of diffusion (Zhang 2010), including definitions and concepts encountered in later chapters. This chapter is not meant to be comprehensive, as detailed, book-length treatments of diffusion theory can be found in other sources. Some discussion of advanced topics of diffusion theory and mechanisms can be found in individual chapters throughout the volume, including models for diffusion in melts (Lesher 2010), multi-species diffusion (Zhang and Ni 2010), multicomponent diffusion (Liang 2010; Ganguly 2010), and defect chemistry (Chakraborty 2010; Cherniak and Dimanov 2010; Van Orman and Crispin 2010). Diffusion data for minerals and melts are most commonly obtained through experimental studies which require analyses of the experimental products; these considerations are reflected in the topics of the next two chapters. For readers who are interested in carrying out experimental research or understanding experimental results and diffusion data, the second general chapter (Watson and Dohmen 2010) covers experimental methods in diffusion studies, with focus on nontraditional and emerging methods. Additional discussion of experimental methods in diffusion studies is provided in Ganguly (2010) and Farver (2010). The third general chapter reviews a range of analytical techniques applied in analyses of diffusion experiments (Cherniak et al. 2010). Experimental methods and analytical techniques are also described in other chapters in the context of discussion of specific diffusion studies. The next five chapters are on diffusion in melts (including glasses), focusing on natural melts relevant in geological systems. Zhang and Ni (2010) discuss the diffusion of H, C and O in silicate melts, which involves multi-species diffusion, where one species (such as molecular H2O) may contribute to the diffusion of two elements (such as H and O in this case). They also assess the relative importance of various diffusing species, and extract oxygen diffusion data in hydrous silicate melts from diffusion data for water. Behrens (2010) offers a thorough review and evaluation of noble gas diffusion data for natural silicate melts and industrial glasses. Lesher (2010) elaborates on the various diffusion models for self diffusion, tracer diffusion, isotopic diffusion and trace element diffusion. Zhang et al. 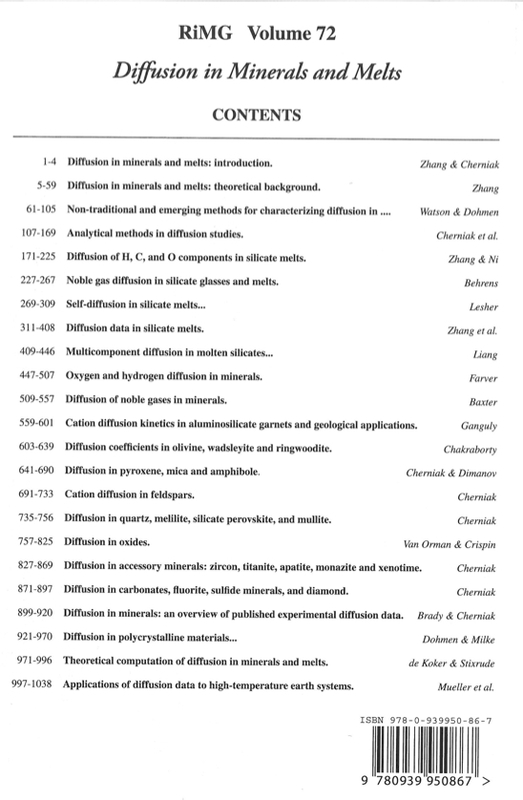 (2010) summarize available diffusion data (focusing on effective binary diffusivities) of all elements in silicate melts. Liang (2010) presents a systematic assessment of multicomponent diffusion studies for silicate melts. The next eleven chapters review and evaluate diffusion data for minerals. Farver (2010) reviews H and O diffusion data for a range of mineral phases and examines the effect of oxygen, hydrogen and water fugacities on diffusion. Noble gas diffusion in minerals, notably diffusion of the important radiogenic nuclides 40Ar and 4He for application in closure temperature determinations and thermochronometry, is reviewed by Baxter (2010). Ganguly (2010) assesses cation diffusion data in garnet, with discussion of multicomponent diffusion in garnet and its geological applications. Chakraborty (2010) focuses on diffusion in (Fe,Mg)2SiO4 polymorphs (olivine, wadsleyite and ringwoodite) with a discussion of the role of defects in diffusion and the effects of pressure on diffusion in these phases. Diffusion of major and trace elements in pyroxenes, amphibole, and mica is discussed by Cherniak and Dimanov (2010). Cherniak (2010a) reviews diffusion data for feldspars, examining the effects of feldspar composition on diffusion in this common crustal mineral. Cherniak (2010d) summarizes diffusion data for the silicate phases quartz, melilite, silicate perovskite, and mullite. Van Orman and Crispin (2010) discuss diffusion in oxide minerals including periclase, magnesium aluminate spinel, magnetite, and rutile, and explore the intricacies of defect chemistry and its effects on diffusion in these deceptively simple compounds. Cherniak (2010b) reviews diffusion in the accessory minerals zircon, monazite, apatite, and xenotime, phases important in geochronologic studies. Diffusion in other minerals, including carbonates, sulfide minerals, fluorite and diamond, is reviewed by Cherniak (2010c). Brady and Cherniak (2010) take a broad overview of extant diffusion data for minerals, examining possible relations among diffusivities for various mineral phases and diffusants to assess trends and correlations that may be of value in developing or refining predictive models and empirical relations. The next two chapters discuss the specialized topics of grain-boundary diffusion and computational methods for determining diffusion coefficients. Dohmen and Milke (2010) present existing data for grain boundary diffusion in polycrystalline materials, discuss theoretical underpinnings and the different types of grain-boundary diffusion regimes, and outline mathematical treatments and experimental approaches for quantifying grain-boundary diffusion. Computation of diffusion coefficients using ab initio methods and molecular dynamics simulations are reviewed by De Koker and Stixrude (2010) with focus on recent progress and what the future may bring for these rapidly-developing techniques. The final chapter is devoted to geological applications of diffusion data (Mueller et al. 2010). The applications outlined include not only forward problems of applying diffusion theory and data to infer rates and extents of diffusion-related processes, but also inverse problems of thermochronology and geospeedometry.